For the last 4 days I have been locked up in a big white box with 100 other writers listening to the famous and revered Robert McKee telling us how to write stories. It was intense and tiring. But it was amazing. 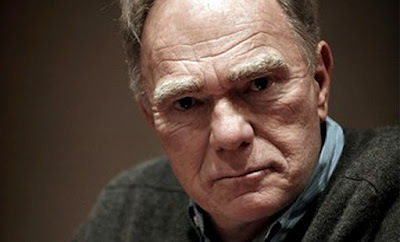 Robert McKee is 71 years old and he is one of the most interesting people I have ever had the pleasure of listening to. What I took from his lectures wasn't just how stories are put together, or how Hollywood works and the films I love are structured, but also a greater understanding of what makes people act the way they do. I learnt about human nature. Robert McKee sees humans as things that must be continually in flux. Like people themselves, stories are all about change. They are about value changes - events that occur to change people's situations - for the negative and the positive. If a story doesn't contain a major change in a value (love, honesty, freedom) then it simply is no story. And why do people need stories? Why do they need negative stories? Why do they want to cry? Why is Literature something we study and revere? Well McKee has an answer for that too. Stories allow us to experience life in a vivid way. Think about your daly life. How much of it do you spend of it locked up inside your own head? How much of it do you spend experiencing extremes of emotion - love, hate, triumph? How many times in a week to you look at something beautiful and feel the real pleasure of being alive? When you go to the cinema all your attention is on the screen - you get to stop thinking about all the things you have to do and instead you get to really feel, really see. Stories are a metaphor for life. Characters are a metaphor for you. The reason why you feel moved by a story is that you have empathised with the character. You see yourself in them - a part of yourself - be it the dark parts you repress or the best parts. So when a character suffers you suffer too - and you experience life. McKee suggested that those people who say "I don't want to see a sad film, I have too many problems in my own life" or those people who say "why do you want to read books that make you cry?" , are those people who are rejecting life - they are emotional cowards who reject flux and wish to live life on a flat emotional plain. As someone who constantly cries when reading books and cries in films - I like this idea. I feel courageous. Apparently it was documented that Holocaust survivors sought out tragic films. They weren't trying to ignore the existence of their sadness. They were seeking to feel that they weren't alone. That what they experienced was human. Human nature, McKee tells us is half good, half bad. This is the reason why so many bad things happen in the world. Robert Mckee tells us that it is the job of the writer to know human nature better than any body. This is the only way to create beautifully 3 dimensional characters. And none knew human nature like Shakespeare. That is why Shakespeare is timeless. As a English Literature student you are often faced with the question - what was the worth of your course? It's not practical like Maths, you can't use it to build a motorway or improve planes or defend victims or cook great dinners. It is all in the head. Well, Robert McKee gave me the best answer I have ever got. Stories, for all the reasons I've talked about above are needed by people. The reason why every civilisation has a form of storytelling is that stories help us to work out who we are, who others are, to deal with our emotions, to feel connected to the world and to live fully. And so I would say that my course, Literature, is actually one of the most necessary of all. Lots of food for thought. I'm not sure I agree with everything Mr. Mckee said about the value and importance of stories, as I think a taste for literature is a very individual thing, but he certainly made some interesting points. Stories aren't just literature - they can be in dance, in opera, in art, in films, magazines, even newspapers. Are the boys getting crazier?